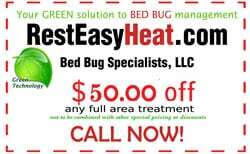 Rest Easy Heat is a GREEN solution to eliminating bed bug infestations. This approach penetrates hard to reach locations to kill bed bugs and their eggs. Rest Easy Heat will kill all of the growth stages of the bed bug including the eggs. Not all current pesticide control methodologies kill bed bug eggs. This means that oftentimes Rest Easy Heat can eradicate the entire bed bug population in a single treatment. At temperatures greater than 113ºF, adults and nymphs die within 15 minutes and the eggs are killed within 60 minutes. Rest Easy Heat uses monitoring systems in real time to ensure lethal temperatures are reached without damaging the space and it’s contents. Raising room temperatures above the thermal death point and maintaining that temperature for several hours normally eliminate a bed bug infestation. We are so confident that our heat treatment is the most effective option, we include a guarantee! Should you experience bed bugs after our treatment, we will come back and treat again at no additional cost. Rest Easy Heat uses state of the art equipment to kill bed bugs. The temperature necessary to heat and kill bed bugs and their eggs is approximately 120ºF – 150ºF to be maintained for an optimal time span. We use remote electronic temperature monitoring systems to ensure lethal temperatures are reached without damaging the space and its contents and also air circulators that move heat to reach insects in all cracks and crevices. Our trucks and equipment do not say bed bugs anywhere.